Appreciating the remarkable services to the 1979 Islamic Revolution and the nation as President of Islamic Republic of Iran – Iran’s Supreme Leader Ayatullah Ali Khameni, on Monday, appointed Dr. Mahmoud Ahmadinjad to country’s powerful state Expediency Council (EC). “In view of the valuable efforts you have made in the great responsibility of the Islamic Republic of Iran’s president in the last eight years and the many experiences you have gained accordingly, I appoint you as a member of the state Expediency Council. May Allah help you succeed,” the Supreme Leader said in his decree. The EC has the authority to mediate disputes between the Iranian Majlis (parliament) and the Guardian Council, and serves as an advisory body to the Supreme Leader, making it one of the most powerful governing bodies in the country. EC members include heads of the three branches of power, the clerical members of the Guardian Council and a variety of other members appointed by the Supreme Leader for five-year terms. Cabinet members and parliament speakers also serve as temporary members when issues under their jurisdictions are under review. In 2005, Ahmadinejad defeated his opponet, former president Ayatullah Hashemi Rafsanjani by securing 61.7% votes, in the second ballot, nearly 26% more than his opponent. In 2009, Ahmadinejad was re-elected by securing 62.6% votes in the first ballot against his main opponent, former prime minister Mir Hossein Mousavi who received only 17% of the total votes cast. Personally, I was expecting Ahmadinejad will return to University of Tehran where he was a professor of civil engineering before he became the Mayor of Tehran and later President of Iran in 2005. However, since he has decided to stay in politic – I wish he make a comeback in 2017 Presidential election. Ahmadinejad’s presidential opponents, Rafsanjani and Mousavi are members of EC. Ayatullah Hashemi Rafsanjani is the Chairman of EC. Mujtahid Hassan Rouhani was also member of EC before elected country’s president in June 2013 by securing 50.7% votes in the first ballot. To conclude this post, I would like to quote US Army veteran, engineer, writer, film-maker and 2012 Presidential candidate from the American Third Position Party, Merlin L. Miller, who visited Islamic Republic last year and met President Ahmadinejad in Tehran. 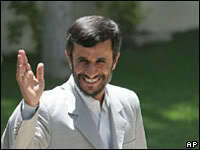 “I found President Ahmadinejad to be humble man with firm handshake and intense, intelligent eyes. Despite his courteous and dignified appearance, he has been regularly berated, and routinely misrepresented, by a controlled western media. Is their demonization justified?, or he has been targeted as the lone political figure standing against Zionist powers? This is my attempt to represent truths, such that the world might have a better understanding of Iran, its people, and its leadership.” Read full article here and also watch a video below.